The trapezius is usually divided into upper, middle, and lower parts. The trapezius attaches from the external occipital protuberance and the medial half of the superior nuchal line of the occiput, the nuchal ligament, and the spinous processes of C7-T12 to the lateral third of the clavicle, and the acromion process and spine of the scapula. 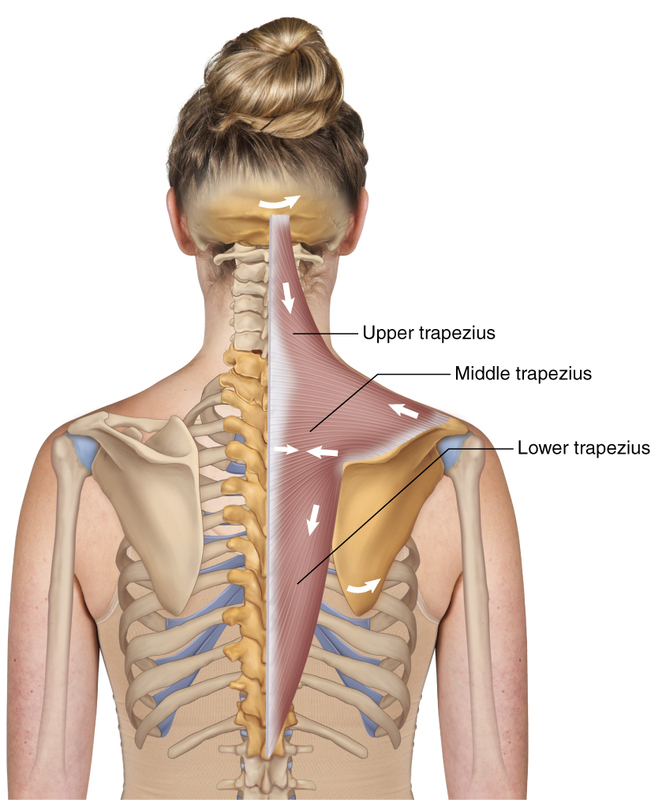 The upper trapezius extends, laterally flexes, and contralaterally rotates the head and neck at the spinal joints; it elevates, retracts, and upwardly rotates the scapula at the scapulocostal joint. The middle trapezius retracts the scapula at the scapulocostal joint. The lower trapezius depresses, retracts, and upwardly rotates the scapula at the scapulocostal joint.